May is coming to a close. It's crazy how fast the months fly by me. This month has been totally crazy for me and I didn't get to post as much as I would have liked but I am just moving on and hoping for an easier month to come. I came across this kitchen and knew immediately that it had to be "nominated" as this months featured kitchen. This is a kitchen that was designed in Montana as part of a getaway home. The designers were going for a rustic and unique look and I have to say they achieved just that. And now let me tell you what details really impressed me: A) I really like all of the unique nook that encases the stove. 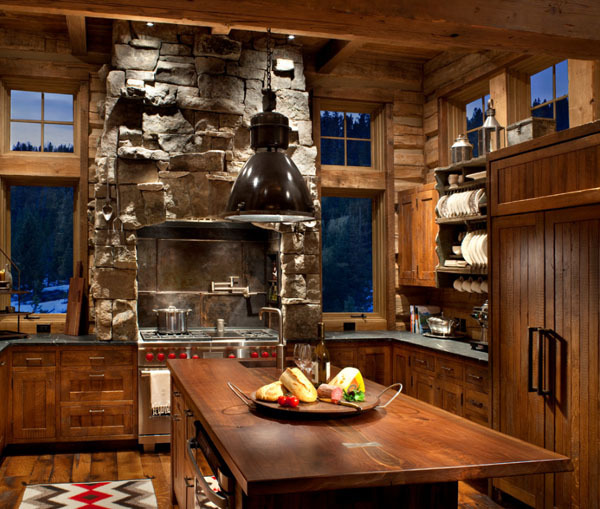 B) The red details on the stove handles and floor rug which add a pop of interesting detail with color. C) The tall country style ceiling. D) The otherwise neutral color theme of browns and greys. I honestly cannot think of a single thing I do not like here. There was obviously alot of thought put in for each and every detail. 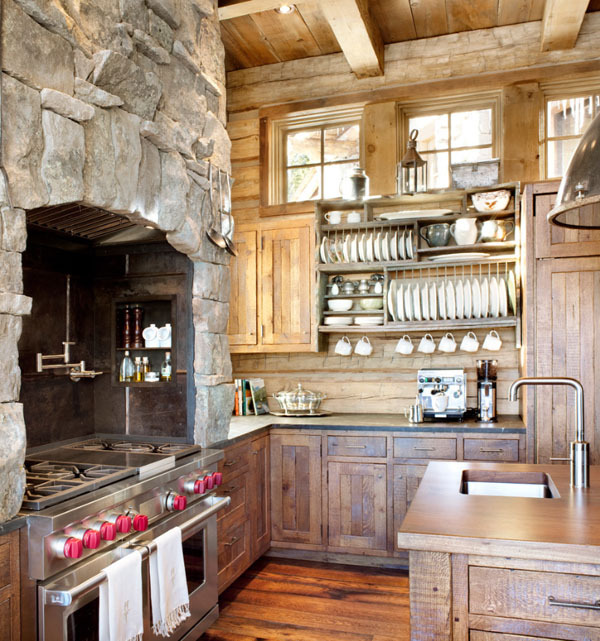 If you love this kitchen like I do then you need to see what the rest of this rustic getaway home looks like. Click here to check that out! 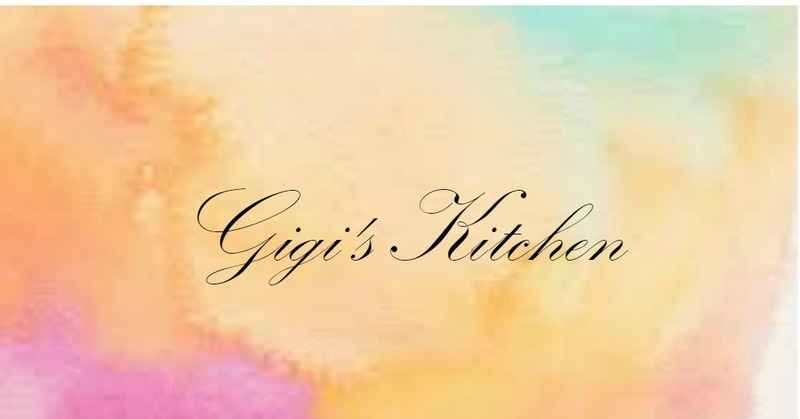 What do you think of think of this months kitchen? 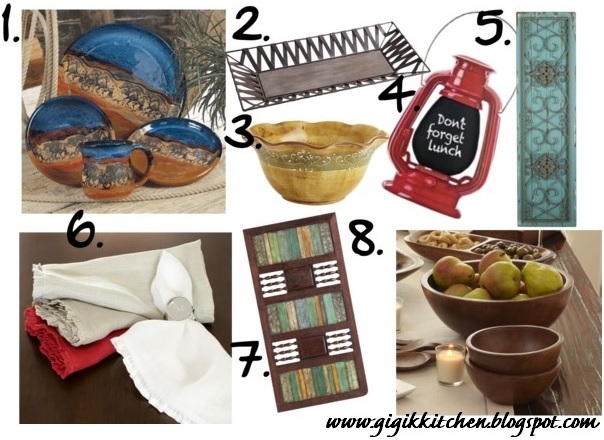 Which of these accessories would you add to you kitchen for that added rustic feel? Let me know in the comments form below I absolutely adore hearing from readers!